I love yarn and I knit alot of scarves. I mean, very much, really, alot of scarves. I wind up with so much in the way of yarn bits and pieces that it becomes hard to keep track of it all. Thus became the Knotty Scarf. A fun way to make sure the last of a skein gets the use it deserves and a fun way to mix colors, styles and textures into one fun and funky scarf. 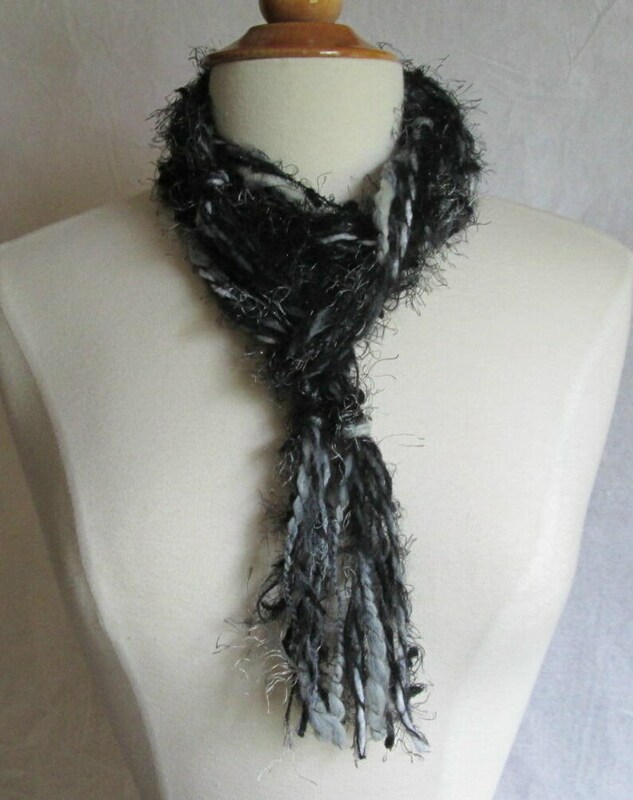 This Knotty scarf features a blend of yarns in shades of black, and grey with touches of white. A great look paired with a your favorite pair of jeans and fitted t-shirt. About 94" long. Mixed yarns - possibly including poly, nylon, acrylic and wool. Handmade in my smoke free home.